Soccer, the most popular sport in the world, has been the topic of many research studies in recent decades. The prevalence of injury in all abilities of soccer players has raised concern for all people who love and participate in the game. Indoor soccer is inherently different than outdoor soccer: increased pace, confined space, fewer players, different turf surface, and for some, the inclusion of boards. It’s fast, fun, and entertaining to watch. However, we have learned through many studies, that indoor soccer players, unfortunately, incur more injuries than outdoor soccer players. Injuries can be devastating for competitive and recreational players alike. The focus, for physiotherapists and players, has shifted toward the prevention of injuries. Warm up: Spend 15-20 minutes practicing soccer specific movements with and without the ball. Accelerating and decelerating while running, changing directions, and jumping, and dynamic stretching should all be included in a warm-up. Stretching: Post-game stretching and cool down can ease tight muscles and reduce the risk of muscle imbalance. Cross training and strengthening: Appropriate core, hip, and lower body strength is required to meet the ongoing demands of indoor soccer. It’s important to address any muscular faults and limitations in balance to reduce the risk of injury. 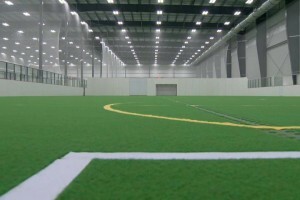 Indoor soccer requires a different set of skills and attributes; as a result, the transition from outdoor to indoor soccer can be challenging for some individuals. There is more acceleration, deceleration, change of direction, and jumping in the indoor game, resulting in an increase in sprains, strains, and bruises. For women, knee ligament injuries are most common; conversely, for men, the predominant injury is an ankle sprain. In youth players, calcaneal tendonitis (Sever’s Disease) and patellar dislocations are common. Despite our best efforts, not all injuries are preventable. These injuries can be severe and limit, or even terminate, participation in soccer and other activities. Timely assessment by a physiotherapist can guide injured players in their rehabilitation and return to playing the beautiful game.